A computer connected to the Internet is subject to intrusion by malicious users. The best remedy against this danger is a firewall such as ZoneAlarm. 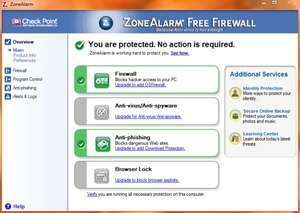 ZoneAlarm is a free firewall with more than a decade of experience. Once installed, your computer is behind an impermeable wall in which only you can authorize the passage of data between programs and the network. Version 15.4.260.17960 is a freeware program which does not have restrictions and it's free so it doesn't cost anything. For security reasons, you should also check out the ZoneAlarm Free Firewall download at LO4D.com which includes virus and malware tests. Additional screenshots of this application download may be available, too.